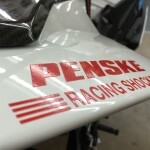 We are excited to announce that we have teamed up with Penske Racing Shocks this year! They built Elyse a lightweight drag shock to her specs and we got it installed this week. We can’t wait to get to the track this weekend and get everything dialed in. Thanks for the support, Penske!